In the last post we looked at “must have” prepper guns for defense. To celebrate turkey day, we’ll look at “must have” firearms for hunting. Most of us in America today, myself included, will celebrate with a store-bought turkey. The majority of Americans don’t hunt for their food anymore. None of it. When our country was first founded, most Americans would have raised their own turkey or hunted for one. For city and suburban preppers, hunting guns make little sense to me. I just don’t see us grabbing our 30-06 and trying to bag a buck. If we’re able to knock off squirrel with our 20 gauge, and not arrested for our efforts, that means 30,000 other people will be outside trying the same thing. In the city, the chances of success are vanishingly small, even for experienced hunters, if people are starving. The competition will be too great. Driving “up North” to go hunting won’t be a good idea either. We’d need to leave our family and venture too far away in a serious crisis. Police in many cities today have things called “shot trackers.” If you take a pot shot at a rabbit, you could be arrested if law and order is still present. Put this all together and my advice: If you’re a city prepper who plans to stay put, you don’t need any guns for hunting. If you’re going to try to procure game in a cityscape, I’d focus on quiet weapons. An accurate spring piston air rifle could take small animals. A slingshot can work. If you developed skill with a bow, you could use it for larger game, but I doubt you’d find much big game. You can even bag birds with a bow if you use Flu Flu arrows. Lesson: City preppers must store, grow, or raise their food. You won’t survive gigging frogs and hunting deer. You have no “must have” hunting guns. If you’re fortunate enough to live where you might procure substantial amounts of meat by hunting, and you’re already a hunter, you almost certainly have the guns you need. Just stock up on cartridges for them. 1) A 22 LR for small game. It could be a Ruger 10/22. 2) A varmint rifle for…varmints. This could be a 223 Remington bolt action or your AR-15. Serious varmint hunters like more esoteric calibers. 3) A larger game rifle (“deer rifle”). It could be a bolt action in 308 Winchester, 30-06, 7×57, or any of several dozen other calibers. Many experienced shooters/hunters love the 7mm Remington Magnum. 4) A “dangerous game” rifle, perhaps needed if you live in Africa. The 375 H&H Magnum is a standard choice. The 458 Winchester Magnum is another. If you live in Alaska and want a firearm for large bear, the 338 Winchester magnum is good. Many would consider the 30-06 adequate for everything in North America, including the largest bear. 5) A lightweight 20 gauge shotgun for upland game. 6) A 12 gauge shotgun for ducks, pheasants, turkey, or just about anything else. If you have a gun representing each of those six groups, you’re prepared to hunt anything anywhere on earth and be appropriately armed. If you want to cut your hunting battery down, most of us don’t need a 20 gauge. It’s handy, but anything it can do, a 12 gauge can do too. A “dangerous game” rifle isn’t needed by most of us. There aren’t too many rhino running around in Minneapolis, Minnesota. Very few lions charge people in Dallas, Texas. The varmint rifle can be skipped too. For most rural preppers who see hunting as viable, there are three “must have” hunting guns: a 22 LR, a 12 gauge shotgun, and a big game rifle. You’re pretty much set to hunt anything in North America with those three weapons. For a 22 LR rifle, it’s good to add a sling for carry (& stability in shooting, if you’ve been taught to use one for that). It’s good to have a low power scope. 4x is good. It’s much easier to aim with a scope than with iron sights. Toss in a few boxes of 22 Long CB caps which are extremely quite from a rifle barrel. The 12 gauge shotgun probably should have a polychoke or choke tubes. A good barrel length is 24″ to 26.” Goose hunters might like 30″ barrels and turkey hunters stubby barrels, but if you can only have one barrel, you’ll need to compromise on length. For most shotgunning, a large front sight bead is appropriate. In addition to stocking birdshot, pack away a few boxes of rifled slugs, which are quite deadly for hunting deer and bear. If you want to use your shotgun for deer and bear, you can purchase a scope mount for it and get a low power (2x) scope. Putting a scope on a shotgun doesn’t make sense to some, but it helps in aiming. While great rifle shooters talk about minute of angle accuracy, shotgun slug shooters talk in terms of “minute of paper plate” accuracy! The deer rifle should be set up like the 22. It needs a sling and a scope. A 2-7x variable scope is a good choice. For reliability and ease of maintenance, I’d go with a bolt action. The most popular calibers are the 308 Winchester and the 30-06, but any caliber you like is good, as long as you stock up on ammo for it. These are my choices for “must have” hunting guns. What choices would you make? I was going to write about the versatile 357 Magnum revolver today, but decided instead to give my opinion about the best handguns for long-term survival under harsh conditions. Which is a better choice: A revolver or a semiauto? Many shooters will tell you the revolver is a reliable choice. You pull the trigger and it fires. That’s true. Usually. But it does neglect one possibility: extreme weapon abuse. In the book, I refer to a Guns & Ammo article of years ago where two shooters each selected two guns for defense. One guy chose revolvers. The other autos. They put the weapons through a series of tests. The weapons were pretty equal until they started burying the weapons in mud and sand. With sand in the action, the older revolvers will grind to a halt. Autos are more robust. The revolver lacks servicability too. With an autoloader, you can strip it and clean it and get it back into action. The revolver takes more knowledge to service. It’s not as easy to fix. Another issue with revolvers is the weapon can be damaged if the weapon falls on a hard surface or is thrown against one. The cylinder can bind or get out of timing. Revolvers are just more finicky. I once had a double action High Standard 22 LR revolver which had horrible lock up at the cylinder. It was always well treated. When shooting it, I felt it was spitting lead back at me. Too much looseness or misalignment between the cylinder and the barrel is an issue autos don’t have. In a perfect world, you’d never get sand in your firearm. You wouldn’t drop your gun. But in the harshest of environments, give me an autoloader. Today was World Toilet Day. Did you celebrate? File this one under “those ba*#*ds! just won’t leave us alone…” went to the store to buy some Lysol disinfecting cleaner. Love that stuff. Looked at the bottle and it no longer says it kills 99.9% of viruses and bacteria. No active ingredients listed. Went home and Googled it and, yep, you betcha, they changed the formula. This is the trend in cleaners. Make it safer environmentally, but make it much less effective. They’ll try and tell us it works just as well. That’s BS. It doesn’t. Watched a good youtube video about propagating roses in the fall/winter. Basic stuff. You take cuttings, use rooting hormone, wrap the cuttings in damp newspaper to keep them moist through the next six weeks or so, etc. In the end, you have little rose plants that can eventually blossom into full rose bushes. With gardening and farming, you must follow the seasons. You need to know when to start something. This is true of life. Many people fail, because they don’t know when to start. The best time to plant a tree: 20 years ago. The second best time: today. It’s that time of the year when we should be following a “Winter is coming” checklist. –Be sure you have ice melt/sand… shovel, etc. A question new preppers ask: “How should I start prepping?” You start prepping survival preparations like anything else. Don’t just jump in without thinking about your objectives and goals. Why do you want to prep? What are you preparing for? How much time and money and effort can you devote to this new undertaking? The answers to questions like these guide your preparations and help you set priorities and goals. As with anything you start in life, you need to find out what supplies you need, what personal skills you should develop, and what physical and mental preparation is necessary. The best way to get started is to learn about the situation you could face. I write a lot about disasters like hurricanes, economic turmoil, and people stranded in their cars during winter storms to show what conditions develop in these situations. Seeing what others go through can guide our preps. We have a comfortable bird’s eye view of people on reality TV. Have you ever watched a TV show like Survivor and wondered how you’d do on it? Have you ever wondered how contestants prepare for these shows? Have you ever wondered how you’d prepare for this or another show? Watching a season or two of Survivor tells you a lot. You see contestants in a tropical environment with a beach. I’ve never seen snow or the arctic. You’ll see the groups struggling to make fire. You’ll see them build shelter. You’ll see groups and individuals competing in competitions, usually involving swimming, diving underwater and doing things, untying knots, solving puzzles, throwing things for accuracy, and balancing. You’ll see them schmooze with each other and plot and plan. If you were going to be a Survivor contestant, after watching the show, you’d have a great idea of what you would need to do to prepare yourself. You’d want to be a good swimmer. You could solve puzzles. Etc. Developing a Survivor-show personal improvement plan wouldn’t be difficult. You wouldn’t be allowed to bring any gear. No bug proof tent. No insect repellant. Not even a lousy toothbrush. In many real world situations, you can have equipment which makes survival much easier and much more comfortable. The third important aspect of prepping for Survivor would be the mental and physical conditioning. Could you function on little food which is mostly a meager rice ration? Would you be capable of eating the living, squirming local delicacies? If you prepped for Survivor, you’d be well prepared for that environment. What if you were rejected by Survivor and accepted by The Amazing Race, another reality show? It would be a whole new ball game. Preparations often need to be tailored to the environment and your unique situation. Contestants on The Amazing Race race around the world. Booking airplane flights, rappelling, and bungee jumping from tall heights are some of the themes the show likes. Some knowledge of foreign languages could be useful. Contestants must perform unusual tasks that relate to the culture of other countries. Some of the tasks are quite physical, demanding strength and endurance. Whether reality TV or survival in a real life situation or when starting any new endeavor, learn as much as you can about the conditions you’ll likely face. Try to list the skills that appear important. Get a feel for the mental and physical preparation necessary. We can all reject being on reality TV. I don’t want to eat live grubs. I like brushing my teeth. I’m not a bungee jumping sort of guy. Unfortunately, when it comes to disasters, we can’t sit back and just watch other people survive them. We can be thrown into those situations unexpectedly. We’re forced to compete. Everybody is suited to basic prepping. Why not have at least a 1 week supply of food and 1 week supply of bottled water? Why not improve your home’s security just a bit? 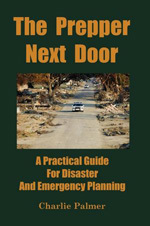 By taking a few simple steps and planning you’ll be ahead of most people when disaster strikes. There is a quote that goes something like this: “Plans are nothing. Planning is everything.” Plans run into reality and are forced to change. The process of planning prepares you to adapt to changing situations. It forces you to consider possible scenarios and contemplate how you’d respond. The better you are at planning in general, the better prepper you’ll be. As an exercise: Plan something. Anything. It could be a butterfly garden. Three key preps for daily life. Here’s a basic list of preps to get you started. This is a very complete list of challenging bodyweight exercises.